Despite recording slower growth in 2012-13, the fashion accessories industry is forecast to enjoy sustained development in the coming years because of strong demand for costume jewelry and leather products. resulting in releases that generally feature intricate decorative accents. 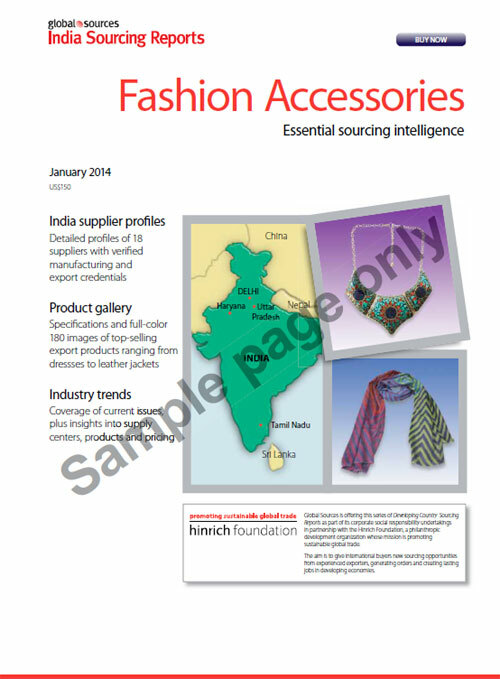 This report focuses on the main types of fashion accessories from India – jewelry, bags and wallets, headwear and neckwear, and belts. ""I found the reports utterly useful and beneficial in helping me source more effectively and efficiently""
""China Sourcing Reports have helped us to focus our search in China and give our clients the best answers about suppliers potential."" ""CSRs are good, time saving, cost efficient and have very interesting additional information needed for sourcing."" or provide alternatives to your current sources. verified by us. Each supplier is confirmed to be authentic with a legally registered business. developing Asia through export promotion. and range of products offered. trends, sales outlook, target markets and challenges.